The Florida Center for Inclusive Communities' efforts are aligned with the Developmental Disabilities Act whereby individuals with developmental disabilities are mandated to have the right "to live independently, to exert control and choice over their own lives, and to fully participate in and contribute to their communities through full integration and inclusion in the economic, political, social, cultural, and educational mainstream of United States society." As a result, the efforts of the FCIC focus on individuals with developmental disabilities achieving full integration and inclusion in society. In this section, we offer information about our community supports initiatives and resources focused on Florida's community supports and services. It is important to prepare and plan in order to handle an emergency situation effectively. To ensure that emergency responders can properly respond to your needs, many residents with special needs can register their information with their county emergency management agency or personal physician. Many counties require that this is done prior to the hurricane season, so pre-register today. "If your medical condition requires that you be hospitalized during a disaster, consult with your physician about getting an authorization letter for preadmission." (St. Petersburg Times April 2007). For comprehensive information, visit the emergency preparedness page. 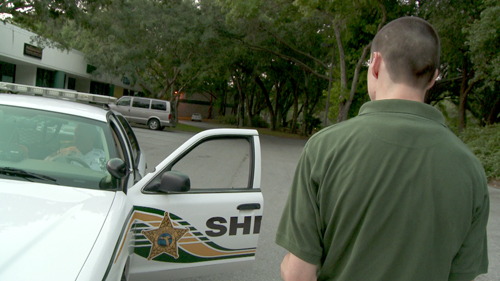 In 2008, the Hillsborough County Sherriff Office’s (HCSO) asked to collaborate with FCIC staff in the development of a "Disability Awareness for Law Enforcement" training curriculum focused on creating awareness and understanding. With funding and support from the Florida Office of Disability and Health at the University of Florida, the FCIC has now published this field-tested, 4-hour curriculum on disability awareness for training law enforcement personnel. The curriculum emphasizes person first language, inclusion and interacting and communicating with individuals with developmental disabilities, intellectual disabilities, mobility disabilities (including cerebral palsy), mental health conditions, deafness, blindness, epilepsy, autism, and Alzheimer’s disease. A curriculum kit is available on CD which includes three sections: 1) Training Overview, 2) Participant Manual, and 3) Trainer Materials. The CD also contains video vignettes, experiential training activities, and interviews with self-advocates. If you would like to obtain a copy of this curriculum free-of-charge, please email Brenda Clark. Historically, students with Developmental Disabilities (DD), even those attending programs in inclusive settings, have not participated in the activities that occur beyond the academic school day. Research clearly supports the benefits of inclusion for students with and without disabilities. SIP results in positive educational and social outcomes for all students involved. 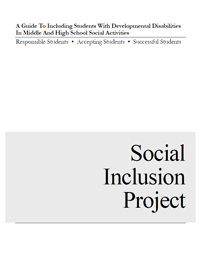 The Social Inclusion Project provides a framework to support the vision of including students with developmental disabilities. The Florida Center for Inclusive Communities is a partner with the Florida Developmental Disabilities Council, Florida Bureau of Exceptional Education and Student Services, and Florida Inclusion Network in the successful development of the Social Inclusion Project (SIP). SIP focuses on creating social opportunities for students with and without developmental disabilities to interact in social activities that are already established in middle and high schools throughout Florida. This fact sheet provides information about inclusion, self-determination, and the supports needed to ensure inclusion happens. People with disabilities, parents, teachers, caregivers and professionals in the disability world have their own language, often referred to as “Alphabet Soup” because it is a mess of acronyms and abbreviations. People not familiar with to this world often talk about how confusing it is. Here is a simple glossary of the acronyms and abbreviations. The subject of sexuality can be daunting. Add to the mix a physical or cognitive disability and you may find yourself feeling totally unprepared to deal with the subject matter. Staff from the Florida Center for Inclusive Communities collaborated with the Florida Developmental Disabilities Council and the Center on Intellectual Disabilities at the University of Albany to create an easy to use workbook for families and educators of individuals with developmental disabilities. 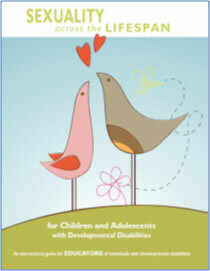 The Instructional Manual and the accompanying Resource Guides are designed to help educators and family members assist individuals with developmental disabilities in their exploration of self and sexuality. A Guide to Supported Living in Florida is a publication that includes information to assist in the decision making process to determine whether or not to choose supported living and philosophical and ideological concepts and best practices for success. This publication provides county-by-county transportation information, including specific services available in each county, as well as contact information for the various agencies that manage transportation services in Florida. 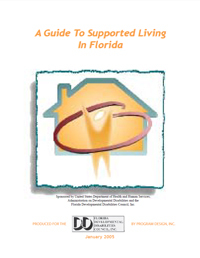 This guidebook offers important tools and tips in an effort to support Floridians who receive Developmental Disabilities Home and Community Based Services (DD/HCBS) or Family Supported Living (FSL) waivers. The content provides a better understanding of the Medicaid waiver with emphasis on managing individual budgets, services, supports, and service providers. This page includes links to both internal (FCIC) and external (non-FCIC) websites. External links are selected and reviewed when the page is published. However, the FCIC is not responsible for the content of external websites. The FCIC website does not accept submissions or requests. The Agency for Persons with Disabilities works in partnership with local communities to support people with developmental disabilities in living, learning, and working in their communities. APD provides critical services and supports for customers with developmental disabilities so they can reach their full potential. The agency serves people with spina bifida, autism, cerebral palsy, Prader-Willi syndrome, Downe syndrome, and mental retardation. The Children's Medical Services is a collection of programs for eligible children with special needs. Each of their programs and services are family-centered and designed to help children with a variety of conditions and needs. 2-1-1 is an easy-to-remember telephone number that connects people with important community services, including transportation options, health care services and other programs to help people with disabilities live independently. This site provides a listing of Florida programs and resources that assist with homeownership. The Lighting the Way to Guardianship and Other Decision-Making Alternatives project is designed to increase the knowledge of individuals with developmental disabilities and their families about guardianship options in Florida, and to increase the knowledge of attorneys and other professionals about Florida’s disability communities and Florida law pertaining to guardianship and guardianship alternatives. Medicaid is a federal-state health insurance program for indigent persons including individuals with developmental disabilities. Special Needs Trusts (or "Supplemental Needs Trusts") are trust instruments designed to preserve SSI, Medicaid and other public benefits for individuals with disabilities. Disability.gov is the federal government website for comprehensive information on disability programs and services in communities nationwide. The site links to more than 14,000 resources from federal, state and local government agencies; academic institutions; and nonprofit organizations. You can find answers to questions about everything from Social Security to employment to affordable and accessible housing. Inclusion Daily Express is a daily international disability rights news service that provides disability advocates with the most up-to-date news, information and commentary about community inclusion, self-determination and social justice, in a way that saves time and is easy to use. This is a free newsletter that is a source for new ways of thinking about developmental disability, inclusive education, and people first language. This is a free newsletter that focuses on daily coverage of important developmental disability news. This is an online magazine with a focus on disability rights. Ragged Edge Online includes thousands of articles and also connect individuals with bloggers writing about disability. Description: For most of us, home is the place where we take refuge from the world, the space where we freely express ourselves, and where we decide who to invite in. Too often, people with intellectual developmental disabilities (IDD) are not included in even the most basic decisions about where and with whom they live. However, there are programs that are making strides in increasing the number of people with IDD who live in affordable, accessible, and integrated housing that they control. This webinar includes best and promising practices drawn from real examples, studies, and lessons learned from experts working on housing issues and policy at the national, state and local levels. Jay Klein, Associate Clinical Professor in the Social Work School in the College for Public Programs at Arizona State University and Joe Wykowski, Executive Director of Community Vision in Portland Oregon share their valuable knowledge, insight, and guidance and address how to overcome the challenging barriers that impede individuals with IDD from achieving the goals of self-direction and community integration. Sexual Health for Individuals with Intellectual Disabilities and Autism: Why Is It Important & What Can You Do About It? Description: Parents and caregivers of children with intellectual and developmental disabilities (IDD) often have so much on their minds that teaching sexual health falls on the backburner. Unfortunately, lack of proper sexual health education may lead to grave dangers for those individuals, including sexual abuse or inappropriate sexual behaviors. This webinar includes studies, statistics, lessons learned, and teaching tips. Presenters: Nila Benito, FCIC Coordinator of Community Supports, and Jackie Selbst, USF second-year medical student. Moderator: Liz Perkins, FCIC Health Coordinator. IMPORTANT! Please complete this 3 minute survey after you view the webinar. Copyright 2011 © All rights reserved. Contact webmaster.